Simon & Schuster, 9781451654424, 320pp. Through the compelling stories of three American teenagers living abroad and attending the world’s top-notch public high schools, an investigative reporter explains how these systems cultivate the “smartest” kids on the planet. 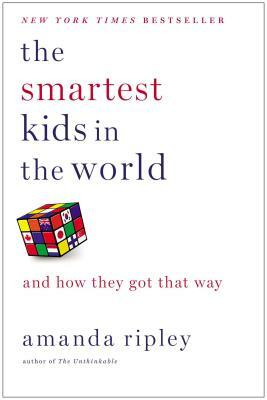 How Do Other Countries Create “Smarter” Kids? In a handful of nations, virtually all children are learning to make complex arguments and solve problems they’ve never seen before. They are learning to think, in other words, and to thrive in the modern economy. What is it like to be a child in the world’s new education superpowers? In a global quest to find answers for our own children, author and Time magazine journalist Amanda Ripley follows three Americans embed­ded in these countries for one year. Kim, fifteen, raises $10,000 so she can move from Oklahoma to Finland; Eric, eighteen, exchanges a high-achieving Minnesota suburb for a booming city in South Korea; and Tom, seventeen, leaves a historic Pennsylvania village for Poland. A journalistic tour de force, The Smartest Kids in the World is a book about building resilience in a new world—as told by the young Americans who have the most at stake. Amanda Ripley is a literary journalist whose stories on human behavior and public policy have appeared in Time, The Atlantic, and Slate and helped Time win two National Magazine Awards. To discuss her work, she has appeared on ABC, NBC, CNN, FOX News, and NPR. Ripley’s first book, The Unthinkable, was published in fifteen countries and turned into a PBS documentary. "If you care about education, you must read this book. By recounting what three intrepid kids learned from the rest of the world, it shows what we can learn about how to fix our schools. Ripley's delightful storytelling has produced insights that are both useful and inspiring." “This book gives me hope that we can create education systems of equity and rigor—if we heed the lessons from top performing countries and focus more on preparing teachers than on punishing them."